Cannot believe that the year has slipped to the end. So this week I was saddened to hear that Johnny Bower passed away on Boxing Day. I always thought of him as a very personable, sweet man. In 2005, I was selected to create a painting for Peel Regional Police to be presented to Johnny as he was their Honorary Police Chief. They had certain key elements they wanted in the painting, and the family sent private photos so they could surprise him at a banquet. I painted the background as a feeling of ice to tie all the elements together. Johnny, you will be missed. September was quite busy. 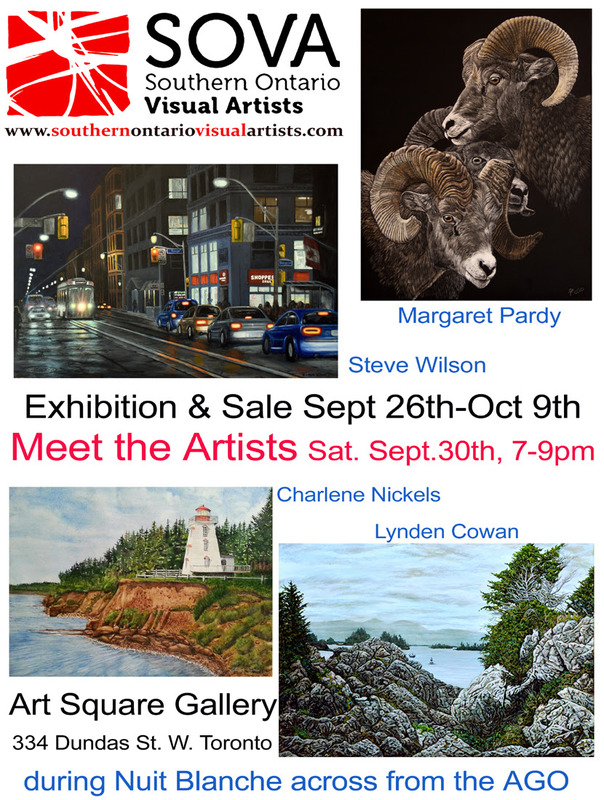 I joined with three other SOVA artists for a wonderful exhibition at the Art Square Gallery in Toronto with an opening reception during Nuit Blanche (the large Toronto Art Festival). Had several successes this year. My painting "Gully" was completed, and was selected for the Colour and Form Society 65th Open Juried Exhibition. It was wonderful that my second painting Twisted Tree was also selected for this exhibition. The Colour and Form Society even selected it for their invitation and program, as seen in the top left image. As well, Fiddle Heads was selected for the ADC 2017 International Juried show, so it went to Cincinnatti, and I was also pleased that my painting Ucluelet, was selected for the Uxbridge Celebration of the Arts juried show. I am looking forward to seeing what 2018 brings. With the SOVA group we have several exhibitions planned for this year, starting with Etobicoke Civic Centre at the end of the month, and the Carrier Gallery in the Columbus Centre in the spring, as well as the Hittite Gallery in Yorkville. Come and visit me in my studio in the Alton Mill Arts Centre, or drop me an email. I plan to keep building this site, but the old one was so out of date I needed to change over, even though there are more things to do.